Language classes – at first glance they seem harmless and quite innocent: learning a new language and getting to know a different culture will enrich your life and help shape your world-view. In general, this is the case. But what if a language class isn’t as innocent as it looks? What if a language class is being used as a covert tool of propaganda and censorship? This is precisely what China’s Confucius Institutes are doing in our own schools and universities. Confucius Institutes have been set up to provide educational programs in reputable schools and universities. Governed directly by the Chinese Communist Party, they’re used as instruments to spread the image of the ‘Chinese Dream’ – an extreme and distorted view of the current totalitarian regime. China lacks all respect for freedom of speech and religion and continues to persecute the Tibetan people, who have lived under illegal occupation since 1950; even simply promoting the use of the Tibetan language is criminalized. In the classrooms of the Institutes, China silences all discussions about topics such as Tibet, Taiwan, Falun Gong and the Tiananmen Massacre of 1989. By suppressing the truth within our own academic institutions, we are permitting China to influence free, unbiased intellectual debate and allowing students to be misinformed and misguided. There are now more than 500 Confucius Institutes and 1000 Classrooms in over 142 countries worldwide – a real threat to our academic freedom and democratic values. The great Chinese philosopher Confucius said, “it is not possible for one to teach others who cannot teach his own family”. So, when education is without truth and without the facts about Tibet, and other ‘sensitive issues’ are wrongfully being portrayed within Confucius institutes, we cannot ignore it. What are we calling on the UK government to do? Investigate whether UK education institutions with Confucius Institutes and classrooms are complicit in discrimination and violate the Equality Act 2010 in their hiring processes. Request that universities make public their contractual agreement with the Hanban and their partner Chinese universities in order to determine whether these violate UK law. Investigate whether a refusal by universities to disclose their agreements with the Hanban amount to a violation of the Freedom of Information Act 2000. Investigate whether Confucius Institutes are being used to monitor, harass and intimidate Chinese students and teachers. 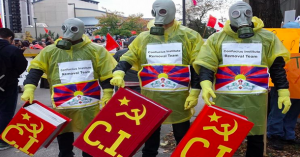 Investigate claims that Confucius Institutes impede any diversity in discussions, especially regarding Tibet, Taiwan and Tiananmen Square in order to prevent censorship and protect freedom of expression. Require that, where Confucius Institutes provide teaching in Chinese history or culture, they adopt a more holistic and comprehensive curriculum that allows for discussion on a diversity of topics, including Tibet, Taiwan and Tiananmen Square. Help us fight this threat to our academic freedoms: contact your MP and demand that Confucius Institutes and Classrooms are properly scrutinised by the UK government.